Here are some of my thoughts on Frozen. I didn’t think Frozen was that great. There, I said it. For the first act of the film I was seriously wondering what all the hype was about. It felt really generic and lame. However, I did find that the film picked up the pace and spiced things up with the introduction of lovable snowman Olaf. But it still wasn’t that great. And another highlight was the Swedish hot tub man sequence. And we had the added benefit of Queen Elsa being honest with Anna around the fact that it’s dumb to marry a prince you just met, I liked that part. I also quite enjoyed the voice acting by Idina Menzel. I watched this on the plane on the way to London. I’ve heard that the animation is quite nice but I wasn’t able to see much of it on the tiny airplane television screen. Half the children I work with were obsessed with this film and had Frozen themed everything – backpacks, stickers on everything, notebooks, posters with the lyrics for ‘Let It Go’ plastered on their bedroom walls. When transporting the kids to appointments or visits they would sing the songs in the car constantly. But the film just wasn’t that good. It was cute, and parts were enjoyable, but overall it felt too generic, and it leaves me wondering as to where all the hype came from. It makes me wonder if the film is really just a triumph of marketing and merchandising rather than a triumph of children’s cinema. Sometimes I feel like only children should be allowed to review children’s films. This may be one such occasion. Maybe the magic was lost on me because I’m not really the target audience. But the songs were catchy and the visuals were nice from what I could see, and I liked the snowman, amongst other things. So ultimately it’s not all bad. Agree with you on this – I didn’t find it amazing. Inside Out was much better and so well done. This was cute, but I think it is just for children. I still haven’t seen Inside Out. Really looking forward to that one! I liked Frozen, but I’ve seen it so many times (It’s all my toddler would watch for the longest time) that I find it supremely overrated. Especially when others act like this is the first time we’ve gotten a cartoon where the girls don’t need men, despite the fact that Brave actually did it a little better a few years before. I’ve never seen Brave, but now I definitely want to! 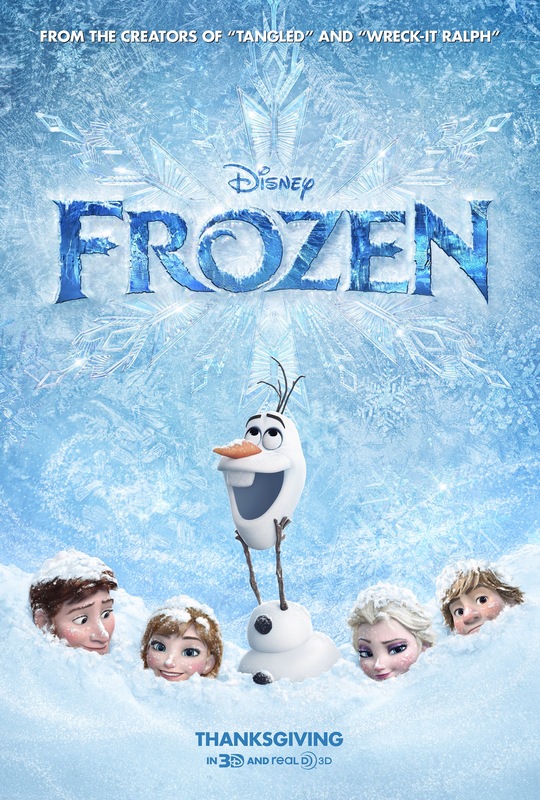 I really enjoyed Frozen but the hype was/is crazy! When it came out in the UK around November time no one seemed bothered and then January hit and the cinemas had to re-release it to keep up with the demand! Wow, that’s funny! I can’t even remember it being in cinemas here, just the insane aftermath and the Frozen merchandise literally everywhere! Good review Anna. Didn’t love it like some did, but still came pretty close. Thankfully “Let it Go” hasn’t surrounded the air-waves in quite some time. You just shattered my daughter’s heart. She loves Frozen. But me…never watched it. It just doesn’t excite me. I need to watch Tangled! I remember so many reviews saying Frozen was in the class of The Little Mermaid, Aladdin, Beauty and the Beast and The Lion King. I thought it couldn’t possibly be that good. I grew up with those movies and wondered was I just having a “get off my lawn” moment. I’ve watched this 3 times and I just don’t get it. Like you said it just seems generic and I don’t understand the major acclaim. Oh yeah, to say that Frozen is as good as any of the Disney classics from my childhood is just a terrible slander. I’m having a “get off my lawn” moment right now just thinking about it! I didn’t think it was that great either!!! I agree with all of your thoughts here, except on Olaf. I hated that dude. Haha! I thought the film picked up a bit when he came in. He was pretty annoying, but in a cute way. I liked the twist on the act of “true love”, which I thought was a good message – and I liked the wardrobe. But I would have to agree – it’s not an outstanding movie. True, I actually liked that twist on true love as well. Totally went against what I expected of the film! I too felt a little underwhelmed by this film. Not terrible by any stretch but not the paradigm shifter I was expecting after all the hype. Agreed. Way too much hype for this one! I haven’t seen this and I hope I never do. Avoid it like the plague! The hype was because of the catchy songs, I think. For me, it’s still a pretty good movie for little girls, and adults who just want a little bit of fun. The catchiest of songs! I’ve actually had the snowman building song in my head all day today.